See the most powerful images of the year. 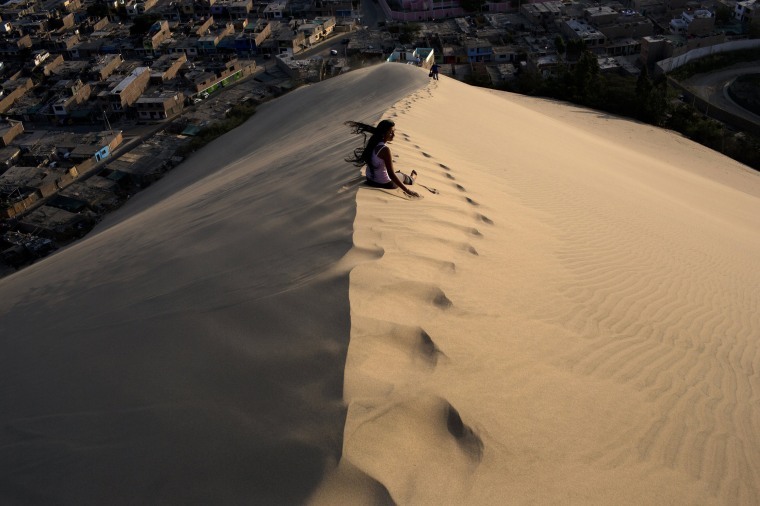 A woman waits for a friend while climbing the Cerro de Saraja, a mountain of sand, in Ica, Peru, on Aug. 7. 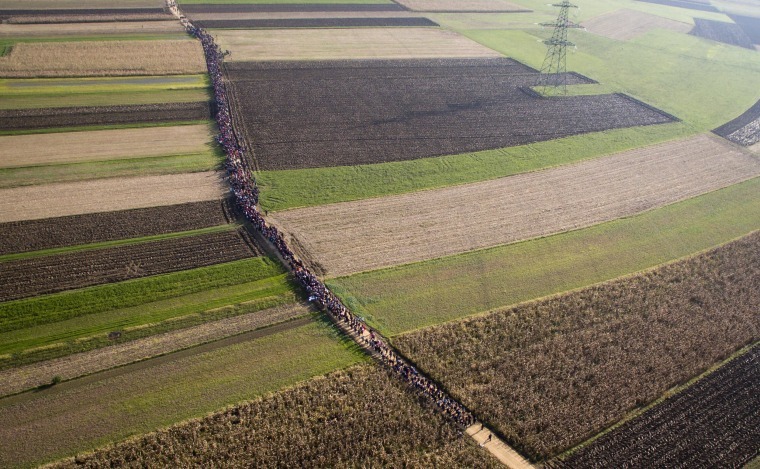 A column of migrants moves through fields in Rigonce, Slovenia, after crossing from Croatia on Oct. 25. Tens of thousands of migrants and refugees are coming from Syria and beyond and marching across the Balkans toward the European Union's heartland. A Ukrainian coal miner waits for a bus after helping in the search for colleagues following an explosion in Donetsk on March 4. An explosion ripped through the coal mine before dawn in war-torn eastern Ukraine, killing more than 30 people. 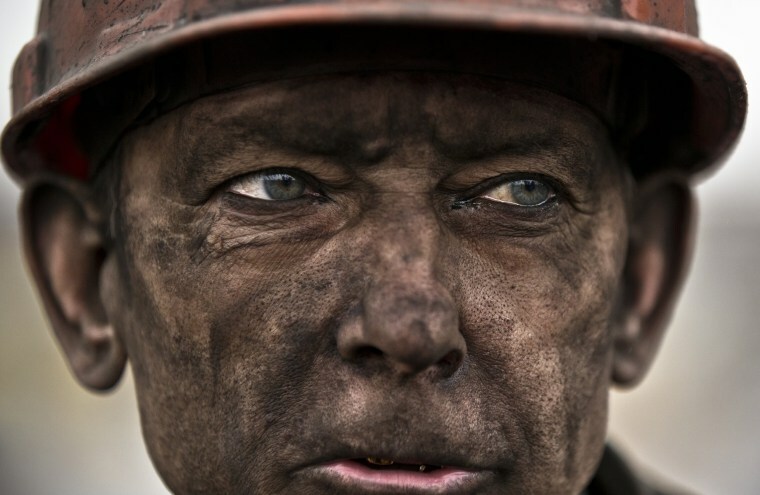 Dozens more miners who were underground at the time were unaccounted for. 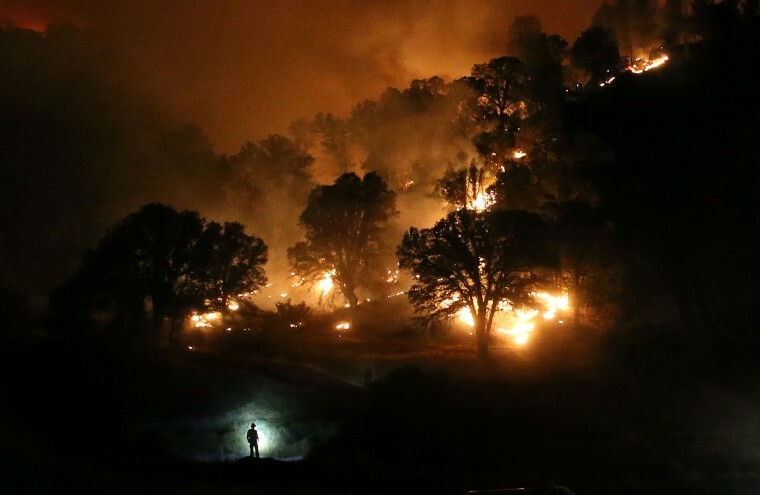 A Cal Fire firefighter is silhouetted by his headlamp as he monitors a backfire while battling the Rocky Fire on Aug. 3, near Clearlake, California. 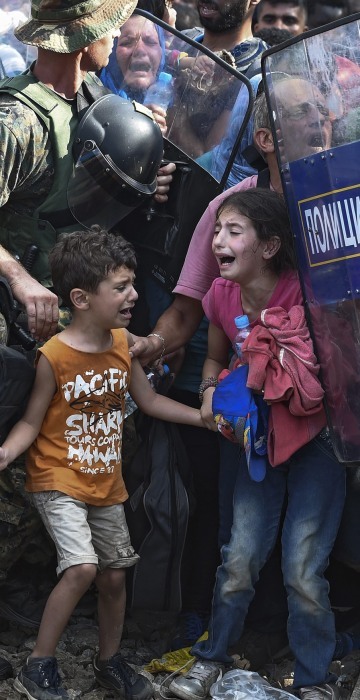 Children cry as migrants waiting on the Greek side of the border break through a cordon of Macedonian special police forces to cross into Macedonia, near the southern city of Gevgelija, Macedonia, on Aug. 21. 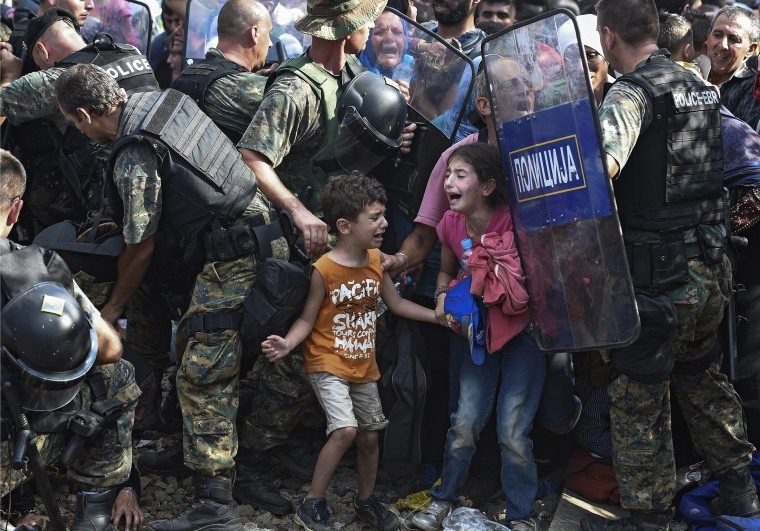 Macedonian police clashed with thousands of migrants attempting to break into the country after being stranded in no-man's land overnight, marking an escalation of the European refugee crisis for the Balkan country. 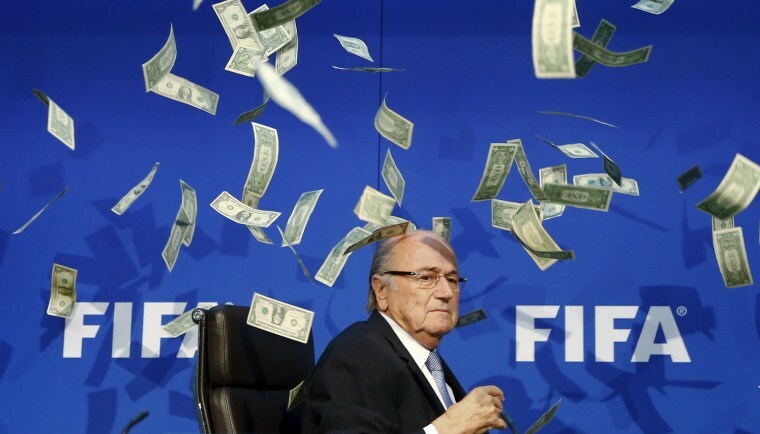 Dollar bills flutter around the head of FIFA President Sepp Blatter as he arrives for a news conference at FIFA headquarters in Zurich on July 20. The shower of cash was tossed by a British prankster. 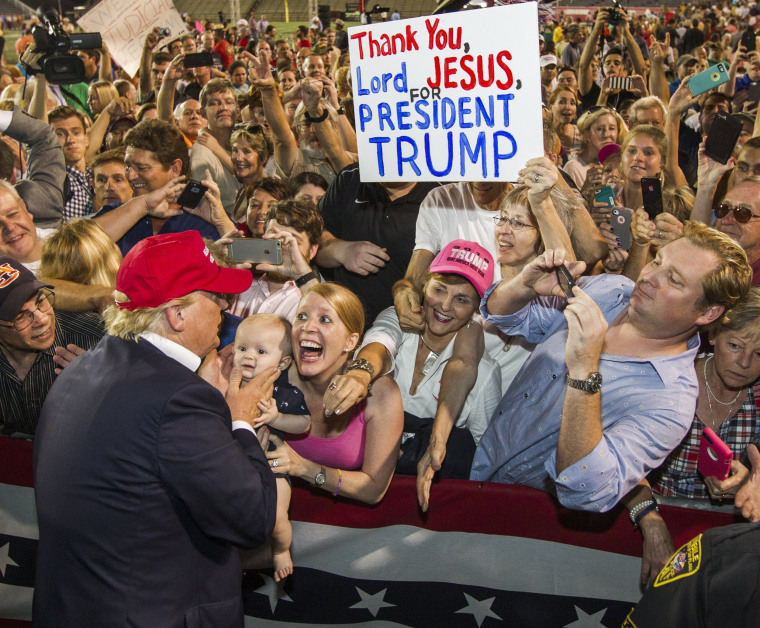 Republican presidential candidate Donald Trump greets supporters after his rally at Ladd-Peebles Stadium on Aug. 21 in Mobile, Alabama. Britain's Prince George peek into the pram of his sister, Princess Charlotte, as he and his parents, Prince William and Kate the Duchess of Cambridge, leave after Charlotte's Christening at St. Mary Magdalene Church in Sandringham, England, on July 5. 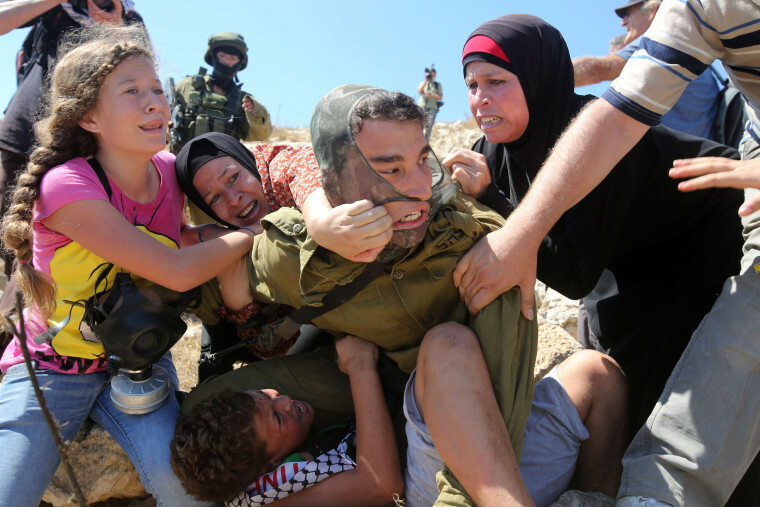 Palestinians fight to free a boy held by an Israeli soldier during clashes between Israeli security forces and protesters on Aug. 28 in the West Bank village of Nabi Saleh, near Ramallah. The clashes followed a march against the confiscation of Palestinian land to expand the nearby Hallamish settlement. 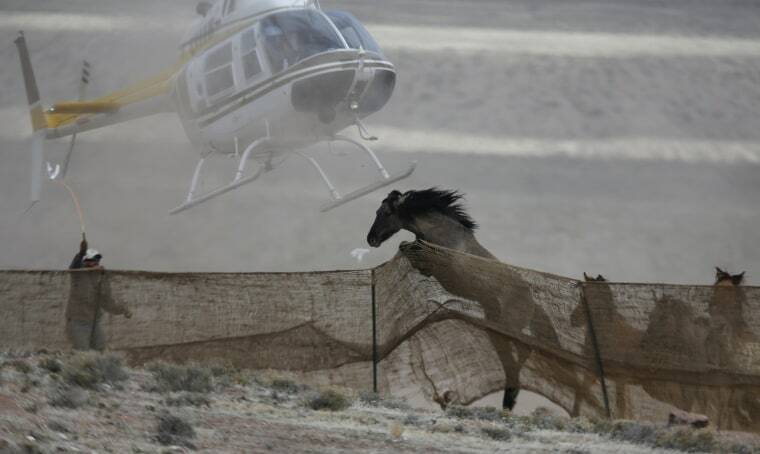 Several wild horses escape as a helicopter is used to herd them into a trap along Highway 21 near the Sulphur Herd Management Area south of Garrison, Utah, on Feb. 26. Citing public safety concerns, 100 horses were rounded-up after three confirmed automobile collisions with horses in the last year. The captured horses were made available for adoption through the bureau's Wild Horse and Burro Adoption Program. 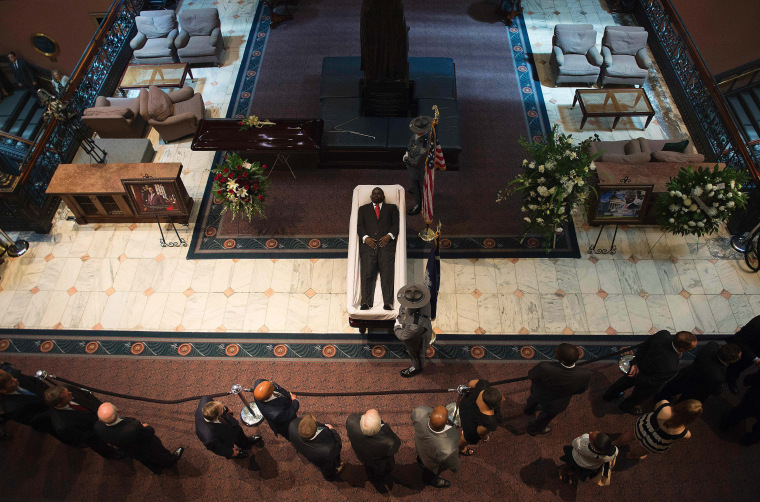 Clementa Pinckney, Emanuel AME Church pastor and South Carolina state senator, lies in state at the South Carolina State House in Columbia on June 24. Pinckney was one of nine black parishioners killed by a white gunman during a Bible study inside Emanuel AME church in Charleston. Malana Pinckney, daughter of Reverend Clementa Pinckney, is hugged by her mother Jennifer at the start of her father's funeral at the Emanuel African Methodist Episcopal Church in Charleston, South Carolina on June 26. 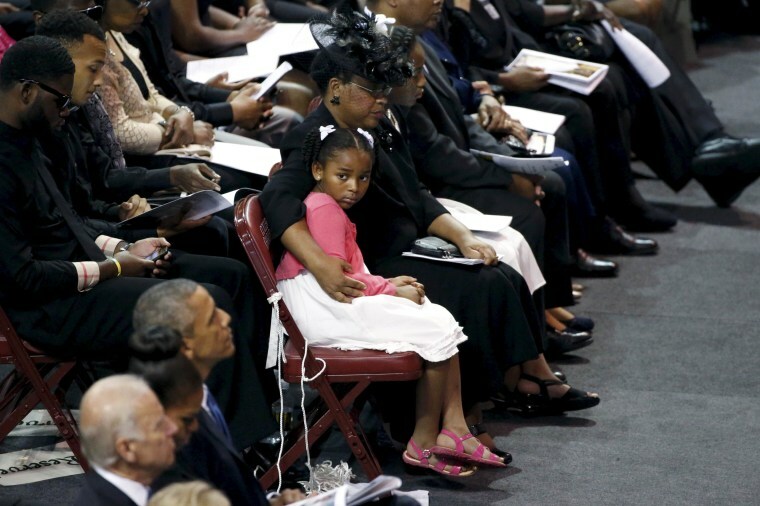 President Barack Obama and Vice President Joe Biden sit across the aisle during services honoring Pinckney’s life. 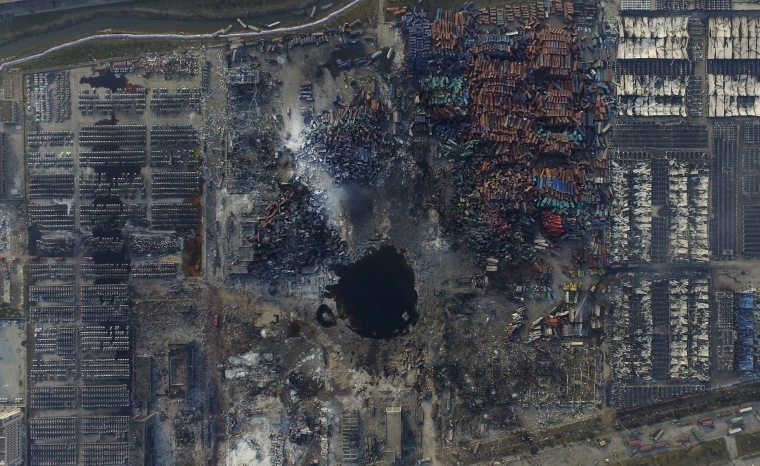 Crumpled containers are scattered at the site of explosions at the port in Tianjin, China, on Aug. 16. Huge blasts at a warehouse storing hazardous materials forced the evacuation of thousands and killed 173, many of them firefighters. 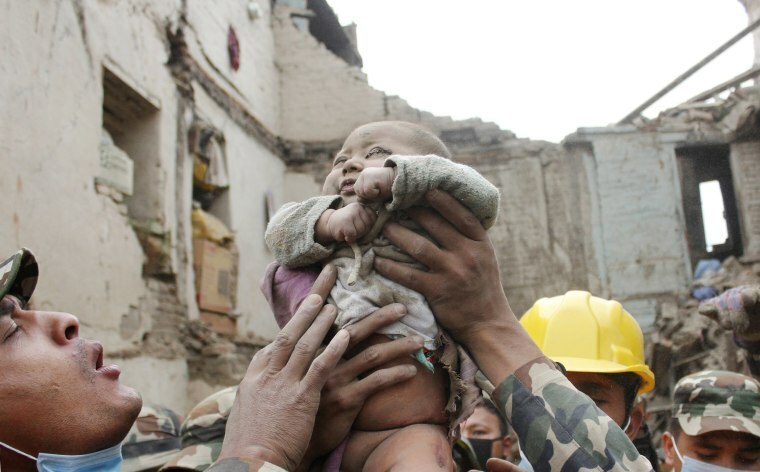 Four-month-old Sonit Awal is held up by rescuers after being trapped for 20 hours in the rubble of his house in Bhaktapur, Nepal on April 26. A 7.8-magnitude earthquake shook the densely populated Kathmandu valley on April 25, collapsing many historic buildings in the town of Bhaktapur, including Awal's home. 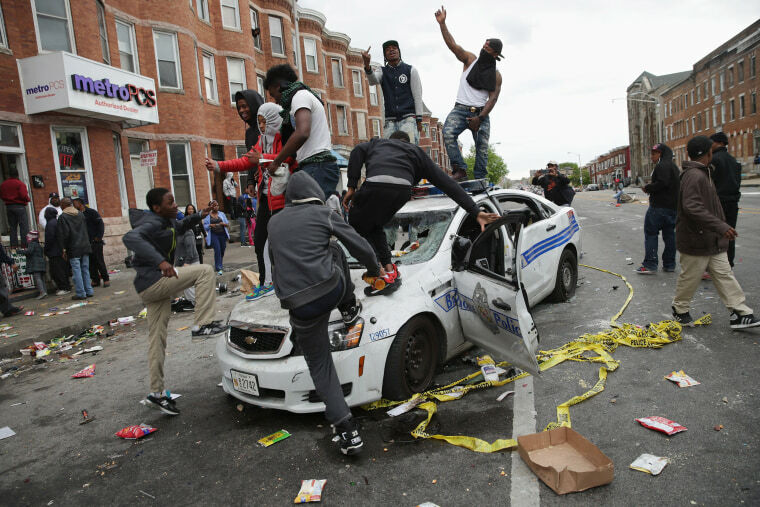 Demonstrators climb on a destroyed Baltimore Police car during protests following the funeral of Freddie Gray on April 27. An Orioles runner, wearing white, races towards home plate during a game against the Chicago White Sox in Baltimore on April 29. 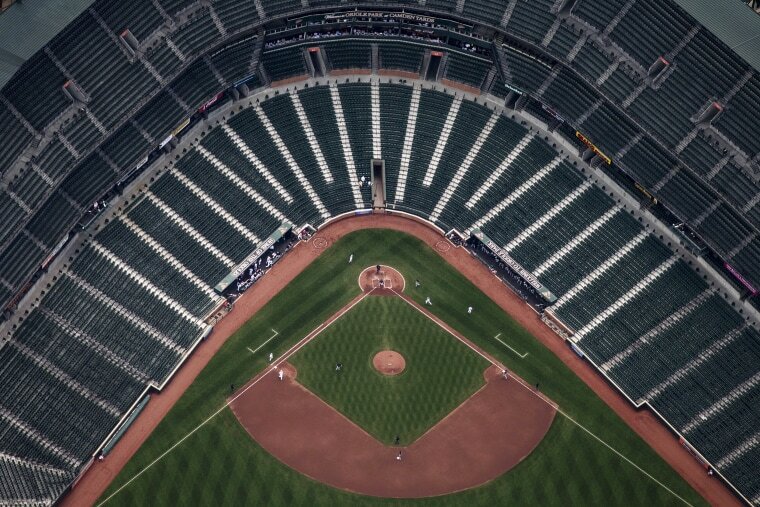 In a first for Major League Baseball, the Orioles hosted the White Sox in a stadium closed to fans as Baltimore coped with some of the worst U.S. urban rioting in years after the death of Freddie Gray. 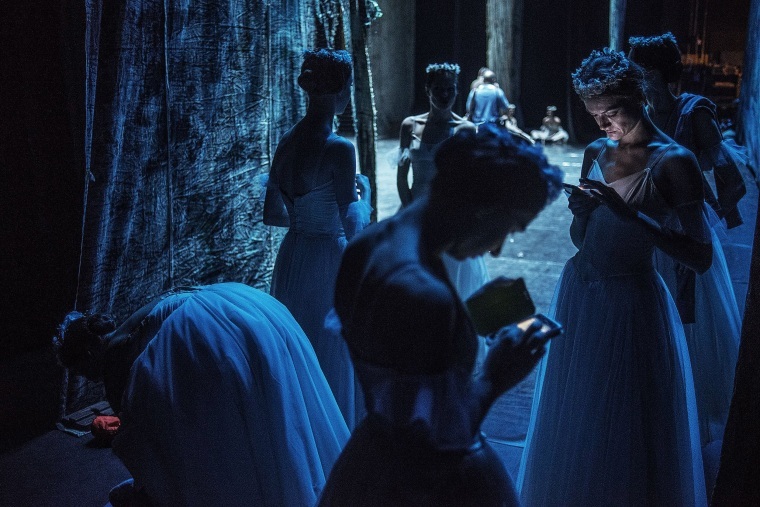 Ballerinas look at their devices during a break in a dress rehearsal for "Giselle" on May 6 in Johannesburg, as the St. Petersburg Ballet Theater kicked off the South African leg of the global season. 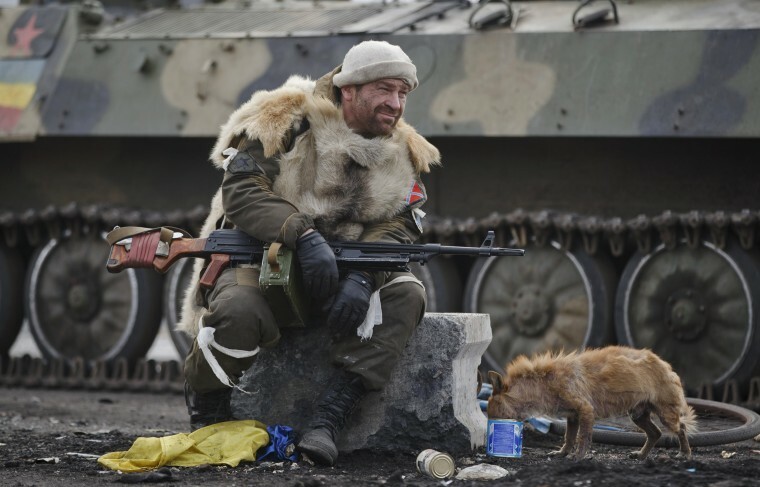 A Russian-backed rebel rests as a dog eats from a can in Debaltseve, Ukraine, on Feb. 20. After weeks of relentless fighting, the embattled Ukrainian rail hub of Debaltseve fellto Russia-backed separatists, who hoisted a flag in triumph over the town. The Ukrainian president confirmed that he had ordered troops to pull out and the rebels reported taking hundreds of soldiers captive. 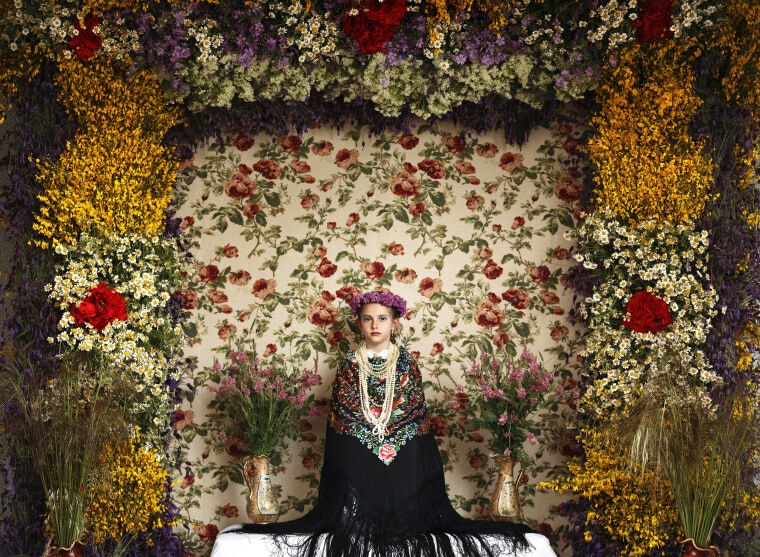 A "Maya" girl sits in an altar during the traditional celebration of "Las Mayas" on the streets in Colmenar Viejo, near Madrid, Spain, on May 2. The festival, which has roots in pagan traditions and dates back to the Middle Ages, celebrates the beginning of spring. A girl between 7 and 11 years old is chosen every year as "Maya" and is required to sit quietly for a couple of hours on an altar in the street. 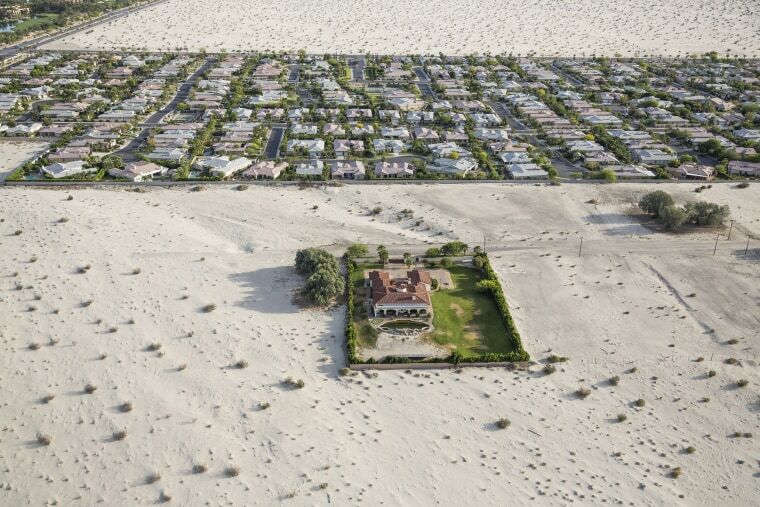 Desert surrounds properties in Rancho Mirage, Calif., on April 3. The state’s history as a frontier of prosperity and glamour faces an uncertain future as the fourth year of severe water shortages prompted Gov. Jerry Brown to mandate a 25 percent reduction in non-agricultural water use. 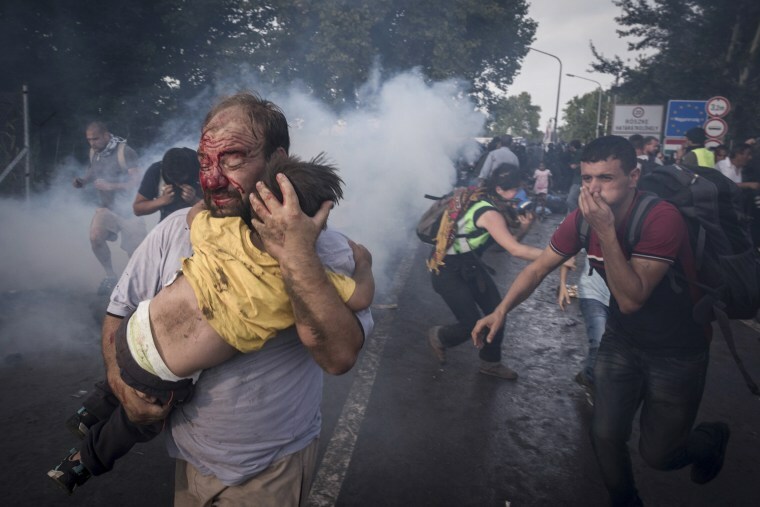 A migrant holds his child during a clash with Hungarian riot police at the Horgos border crossing in Serbia on Sept. 16. Hundreds of migrants were stranded on Serbia’s border with Hungary as Hungary’s decision to seal its border rippled across Europe and other migrants scrambled to find alternative routes, in an effort, in most cases, to reach Germany. 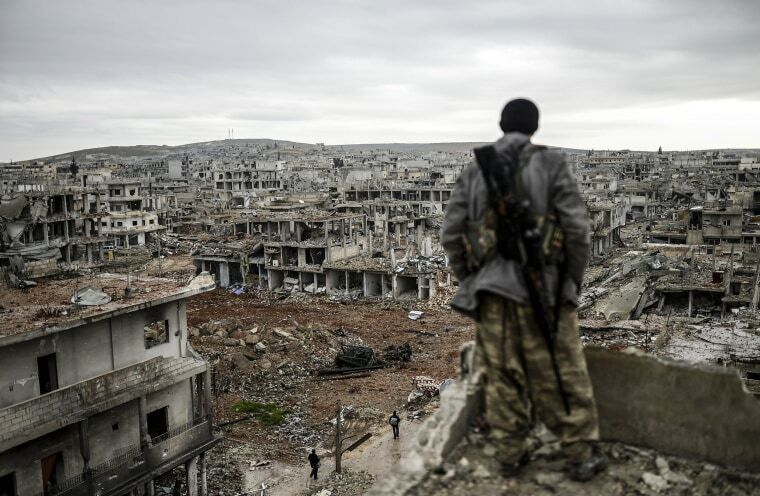 Musa, a 25-year-old Kurdish marksman, stands atop a building as he looks at the destroyed Syrian town of Kobane, also known as Ain al-Arab, on Jan. 30. Kurdish forces recaptured the town on the Turkish frontier on Jan. 26, in a symbolic blow to the jihadists who have seized large swathes of territory in their onslaught across Syria and Iraq. 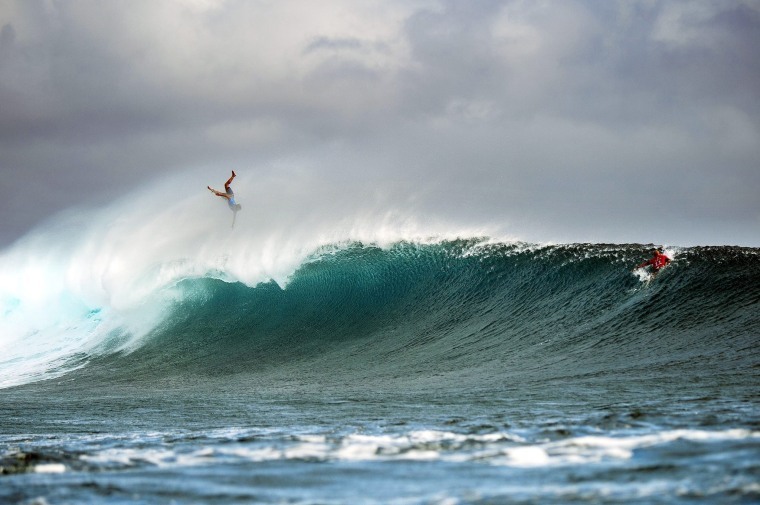 Italo Ferreira of Brazil flies through the air after pulling out of a wave as his opponent Kelly Slater of the United States of America paddles past at a World Surf League competition off Tavarua island, Fiji, on June 15. 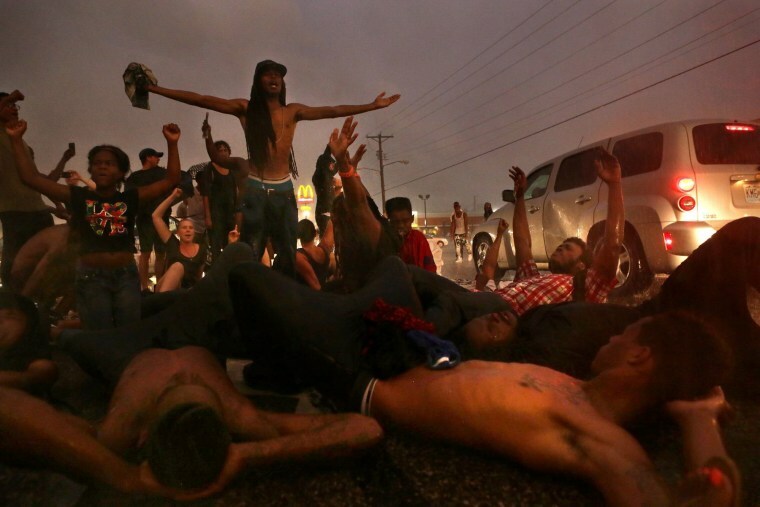 Protesters lay down on West Florissant Ave. in Ferguson, Mo., on Aug. 9, the one-year anniversary of the shooting death of Michael Brown by a police officer. Darren Wilson was exonerated of criminal wrongdoing in the death of the unarmed teenager, but remains the target of a wrongful death lawsuit. 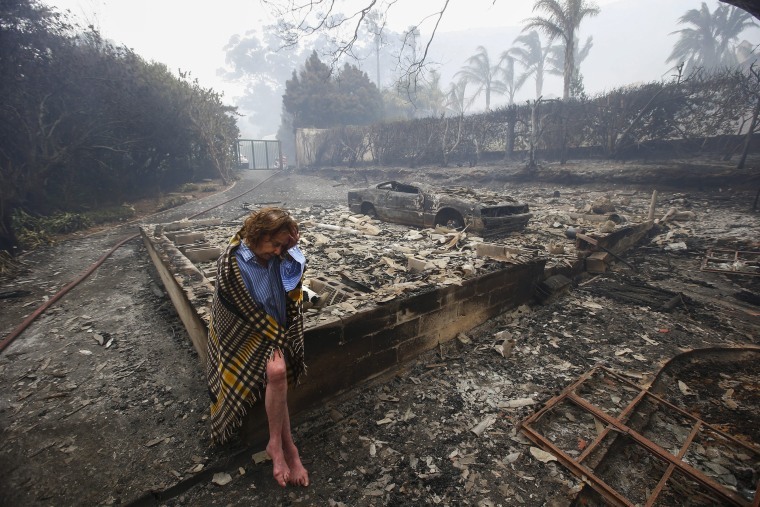 Fran Collings, 82, sits in the remains of her destroyed home in Tokai, Cape Town, South Africa, on March 4. A fire fanned by gale force winds raged over 7,000 acres around the Cape Town south peninsula. 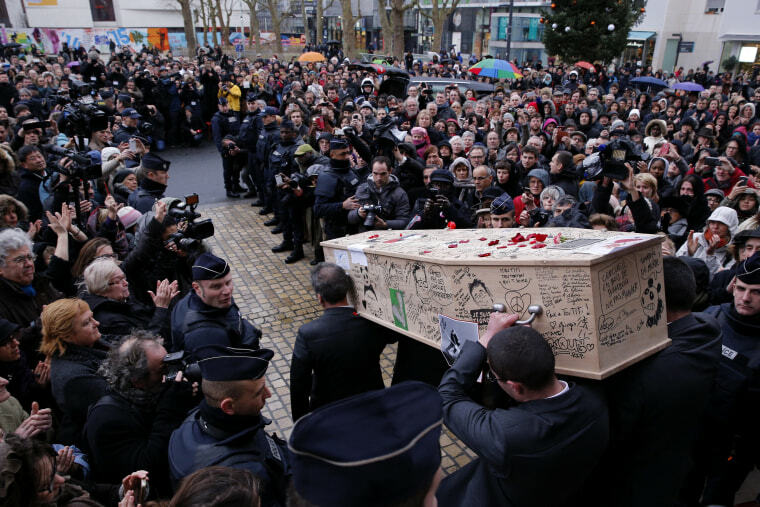 The coffin of cartoonist Bernard Verlhac, who drew under the name Tignous, is carried out of the city hall of Montreuil, France, after a funeral service on Jan. 15. Verlhac and 11 others were killed in a terror attack at the offices of Charlie Hebdo, a French satirical magazine that has published controversial Muhammad cartoons. 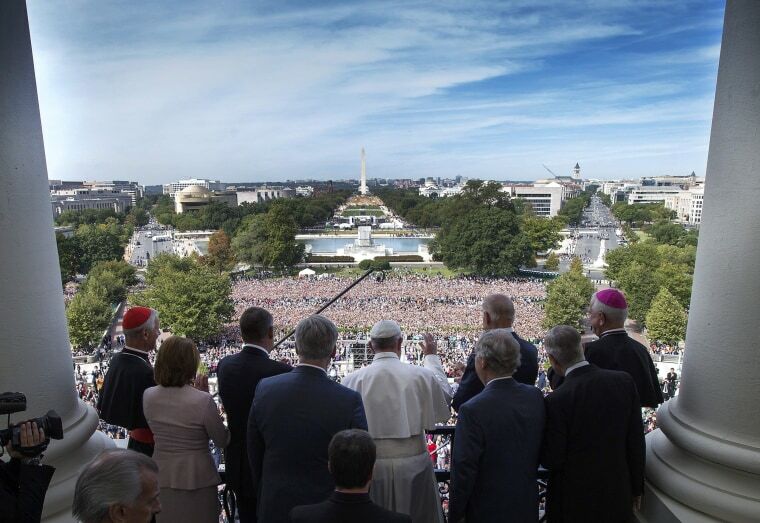 Pope Francis is welcomed to the Speaker's Balcony at the U.S. Capitol by members of Congress on Sept. 24. After visiting Washington and New York City, Pope Francis concluded his U.S. tour with events in and around Philadelphia. A shark fin looms behind Australian surfer Mick Fanning during the final of South Africa's J-Bay Open on July 19. 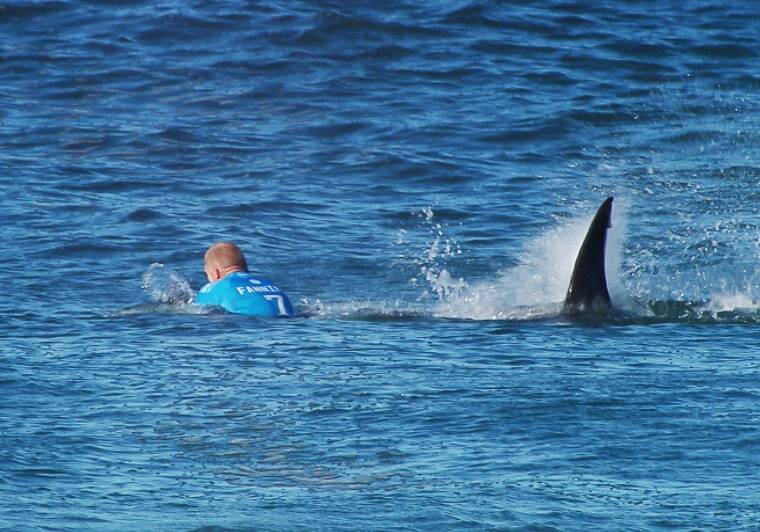 Fanning fought off the suspected great white shark, punching it as it attempted to pull him underwater by his foot rope. He escaped uninjured. 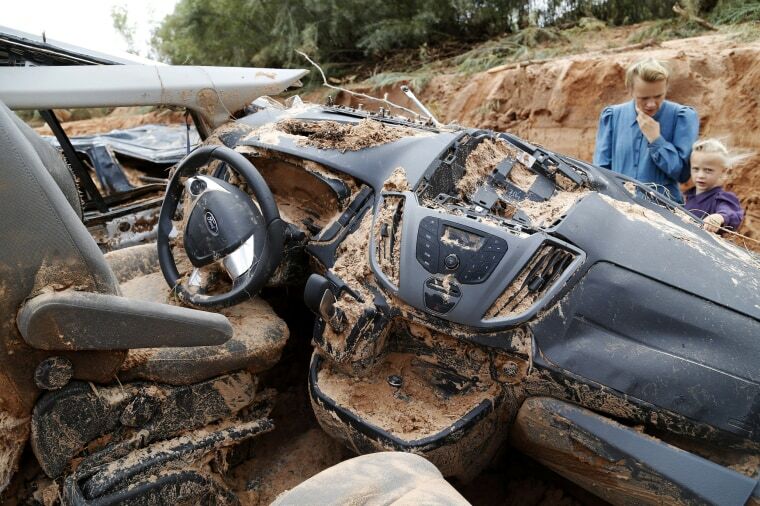 The little Utah town where at least eight people were killed in a flash flood is the home of a polygamist religious sect whose leader was sentenced to life in prison for sexually assaulting girls he considered brides. 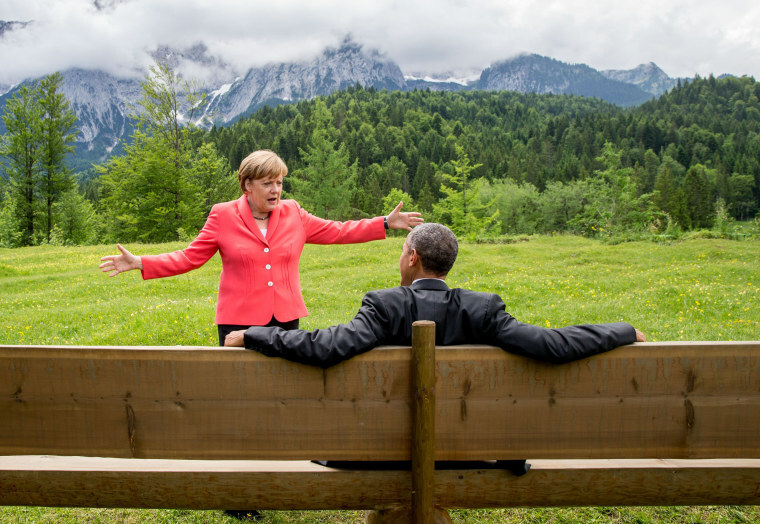 German Chancellor Angela Merkel speaks with President Barack Obama during the G-7 summit near Garmisch-Partenkirchen, southern Germany, on June 8. 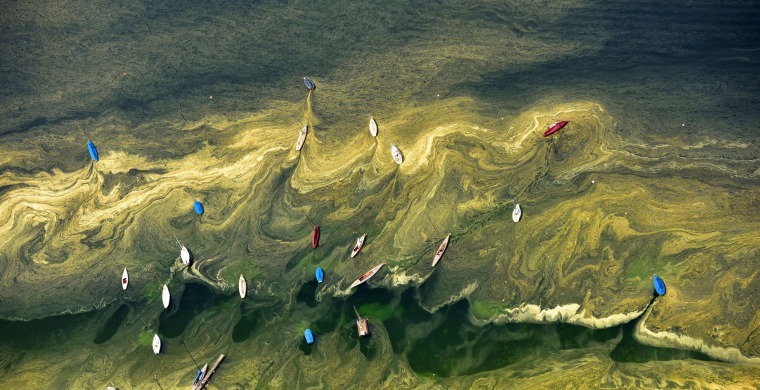 Swirls of pollen surround sailing boats in Lake Starnberg, southern Germany, on May 8. 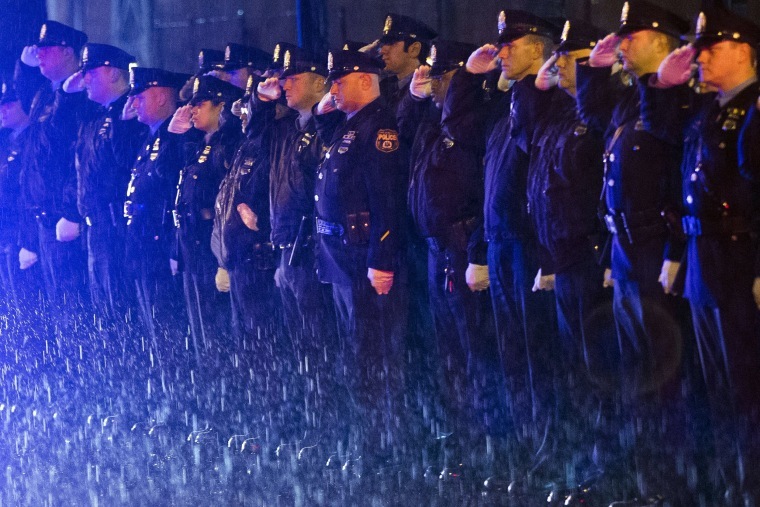 Police officers salute as the coffin of officer Robert Wilson III arrives before a funeral procession on March 14 in Philadelphia. City officials said Wilson was shot and killed after he and his partner exchanged gunfire with two suspects trying to rob a video game store. 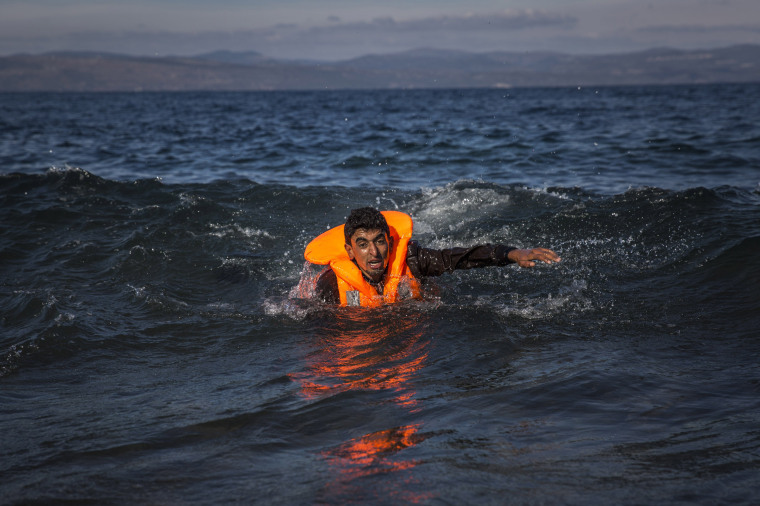 A migrant arrives on the Greek island of Lesbos after crossing the Aegean sea from Turkey on an overcrowded inflatable boat on Oct. 27. Hundreds of thousands of refugees and migrants fleeing war or seeking new lives have flooded into Europe. A police officer investigates the scene before carrying the lifeless body of 3-year-old refugee Aylan Kurdi from the beach near the resort-town of Bodrum, Turkey, on Sept. 2. 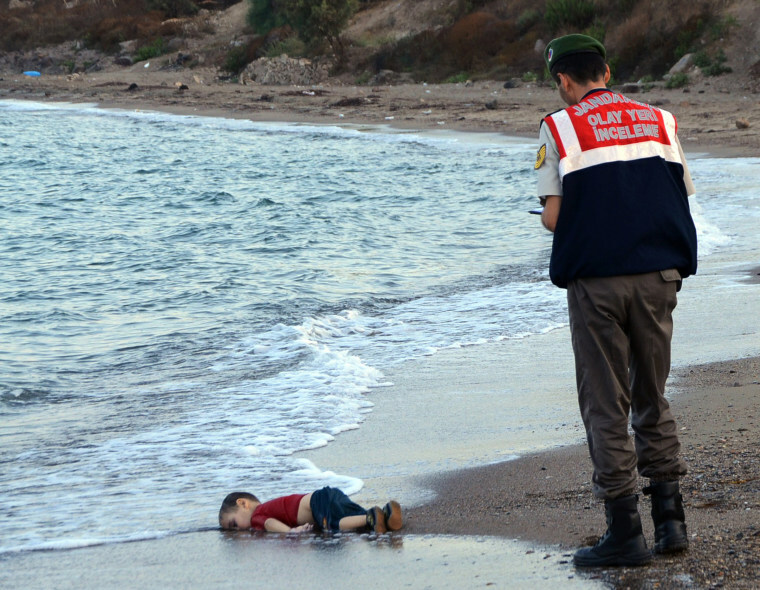 The pictures of the drowned toddler ricocheted across social media — hailed as emblematic of the desperate and deadly refugee struggle to reach Europe. 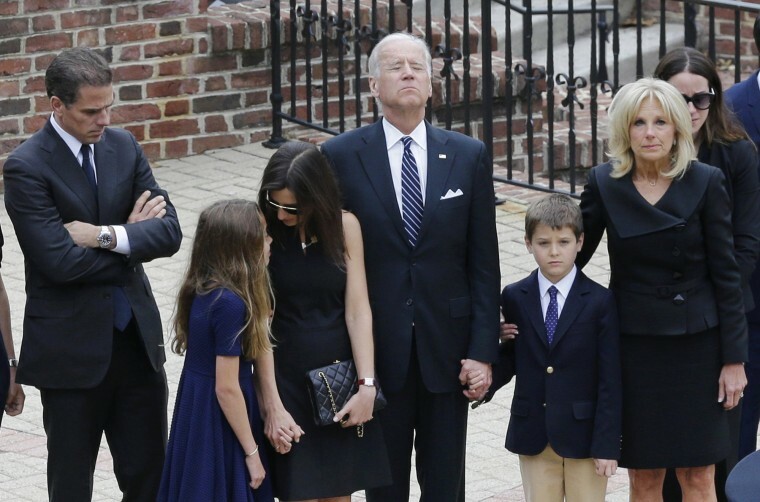 Vice President Joe Biden, center, pauses his family as they to enter a visitation for his son, former Delaware Attorney General Beau Biden, on June 4 at Legislative Hall in Dover, Del. Standing with Biden are, from left, his son Hunter, granddaughter Natalie, daughter-in-law Hallie, grandson Hunter and wife Jill. Beau Biden died of brain cancer at age 46. 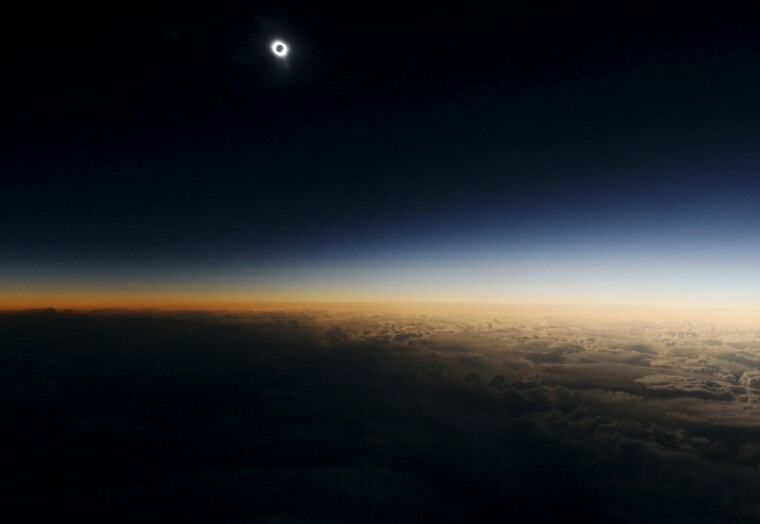 The moon passes in front of the sun during a total solar eclipse witnessed from a plane over the Norwegian Sea on March 20. 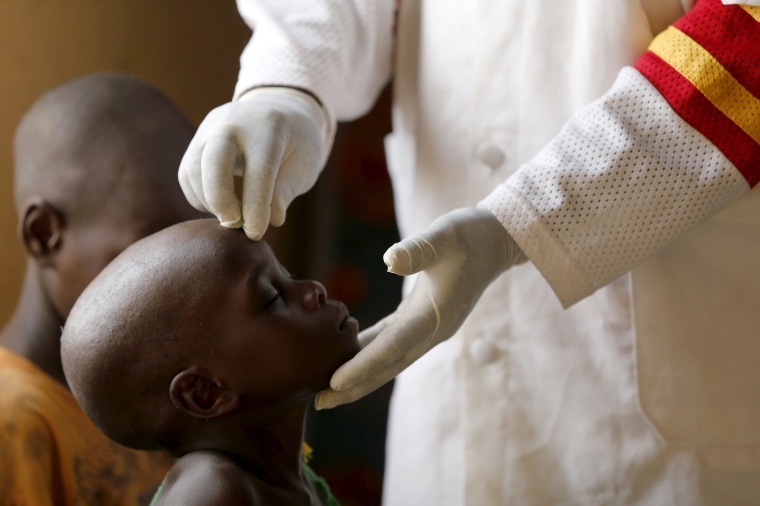 A child rescued from Boko Haram in the Sambisa forest is attended to at a camp for the displaced in Yola, Nigeria, on May 3. Hundreds of traumatized Nigerian women and children rescued from the Islamist militant group were released into the care of authorities at the camp. Kevin Jorgeson embraces his girlfriend, Jacqui Becker, after summiting The Dawn Wall on El Capitan in Yosemite National Park with fellow climber Tommy Caldwell on Jan. 14. The two spent 19 days on the climb, considered by many to be the most difficult in the world. 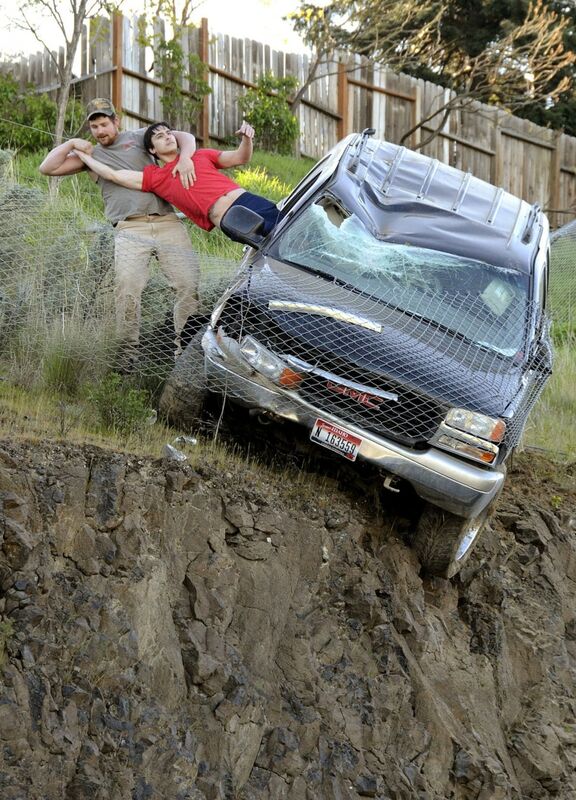 Jason Warnock pulls Mathew Sitko to safety after his SUV left the road and was stopped by a chain link fence just short of a 30-foot vertical drop on April 15 in Lewiston, Idaho. Warnock saw 2000 GMC Yukon teetering over the edge of the 30-foot drop — held in place by a chain link fence. He ran up the road and to a pedestrian bridge to reach the vehicle. 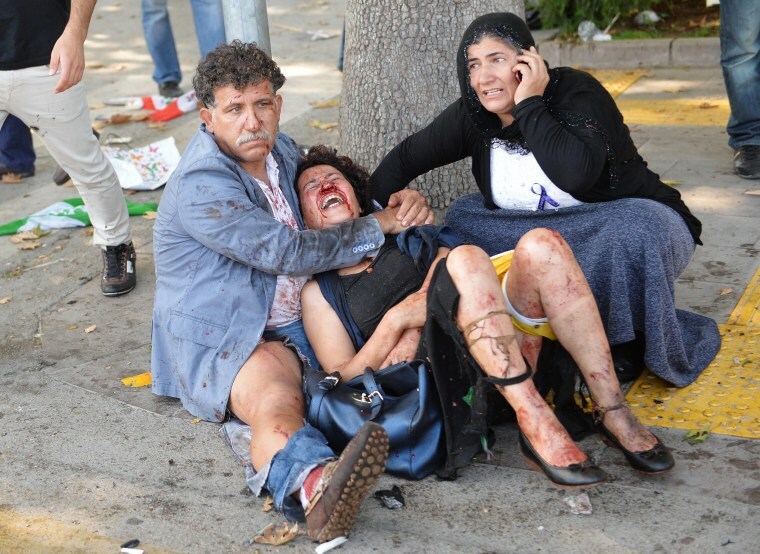 People try to comfort an injured woman after multiple explosions ahead of a rally in Ankara, Turkey, on Oct. 10. Twin bomb blasts killed 102 people outside a train station in the Turkish capital, Ankara, as pro-Kurdish groups were gathering for a planned peace rally. U.S. intelligence officials say the attack was directed by ISIS. A wounded woman, left, holds the hand of a dying woman after an explosion rocked the Turkish city of Suruc near the Syrian border on July 20. Turkish officials said the bombing, which killed 32, was part of an ISIS retaliation campaign against the government's crackdown on the extremists' operations in Turkey. 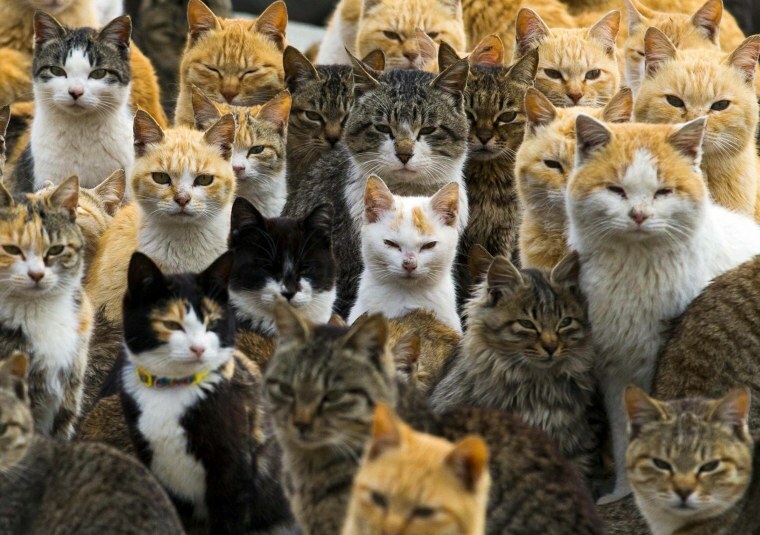 A crowd of cats gather on Aoshima Island in southern Japan on Feb. 25. An army of cats rules the remote island, curling up in abandoned houses or strutting about in a fishing village that is overrun with felines outnumbering humans six to one. 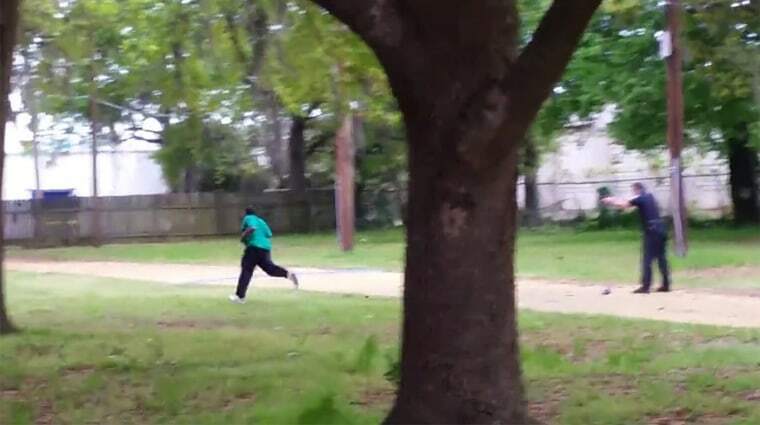 Walter Scott runs from police officer Michael Thomas Slager before he was shot in a video taken by an anonymous bystander in North Charleston, South Carolina, on April 4. The city of North Charleston agreed to pay $6.5 million to the family of Walter Scott, the unarmed African-American man who was shot in the back by a white police officer, settling a potential lawsuit after six months of negotiations. Scott, 50, died after he was shot as he was running away from Slager, who fired eight shots at Scott in a confrontation recorded on a bystander's video. He remains held without bond on a charge of murder. 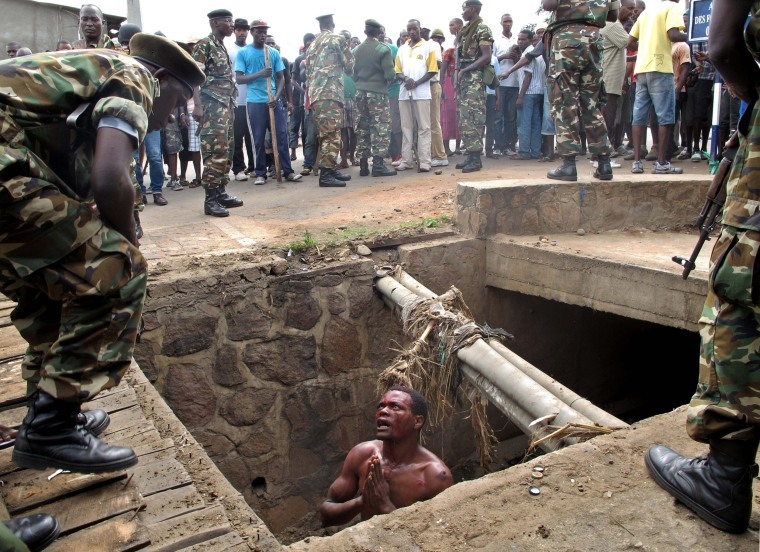 Jean Claude Niyonzima begs for help from the military as he stands in a drain where he hid to escape a mob in Bujumbura, Burundi, on May 7. Niyonzima was attacked for being a suspected member of the ruling party's Imbonerakure youth militia as protesters took to the streets to rally against the president's bid for a third term. 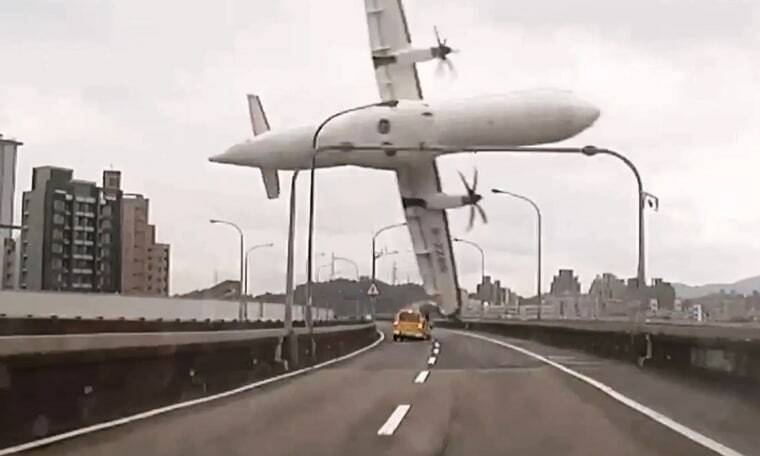 A TransAsia turboprop plane clips an elevated motorway and hits a taxi before crashing into the Keelung river outside Taiwan's capital Taipei on Feb. 4. The captain of the TransAsia Airways plane mistakenly switched off its only working engine seconds before it crashed, killing 43 people, according to Taiwan’s Aviation Safety Council. 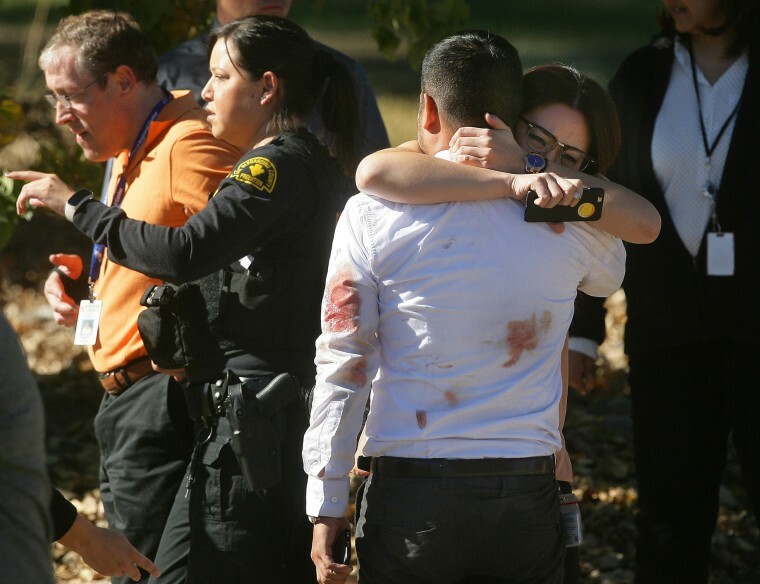 A couple embraces following a mass shooting on Dec. 2 in San Bernardino, Calif. Fourteen people shot and killed when two attackers, a coworker and his wife, opened fire on San Bernardino County employees celebrating a holiday party at a state-run health center. The FBI is investigating the case as an act of terrorism. Schoolgirls rest on a banquette at the Museum of the Great Patriotic War at Poklonnaya Gora in Moscow on April 28. Russia celebrated the 70th anniversary of the 1945 victory over Nazi Germany on May 9. 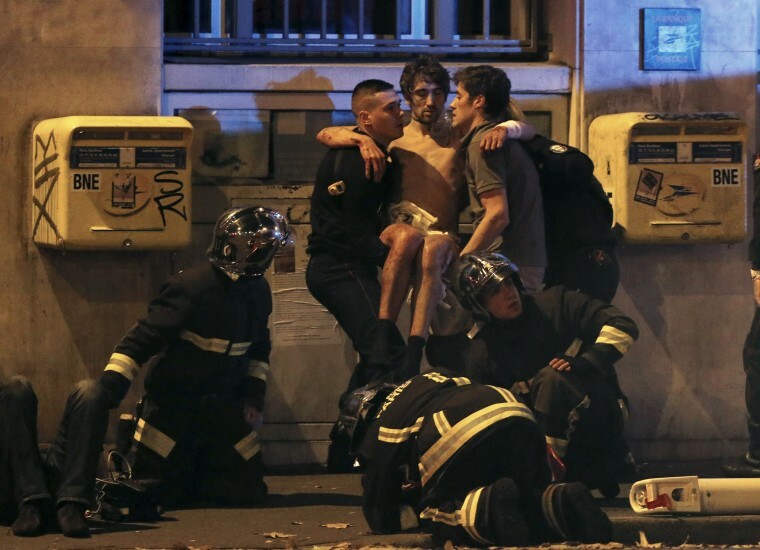 French firefighters aid an injured man near the Bataclan concert hall in Paris on Nov. 13. The attack at the Bataclan was part of a coordinated series of terror attacks in Paris that left 130 people dead. 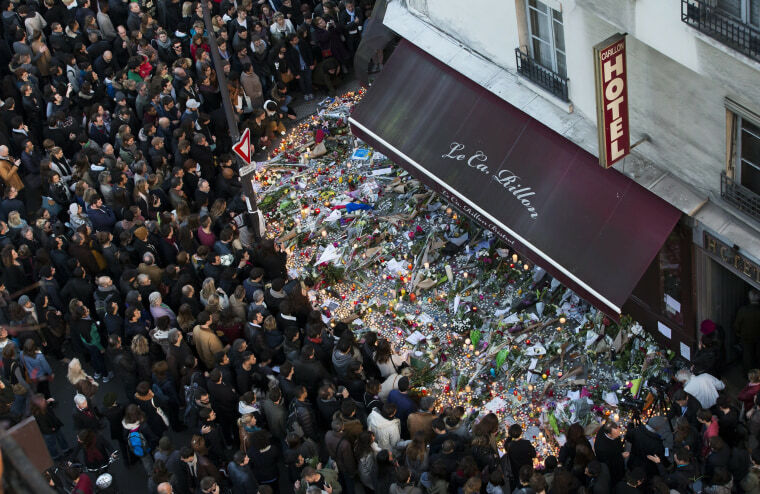 A large crowd gathers to lay flowers and candles in front of Le Carillon in Paris on Nov. 15. Le Carillon was one of the first restaurants hit in the multiple attacks across Paris by ISIS gunmen and suicide bombers that killed 130 people. 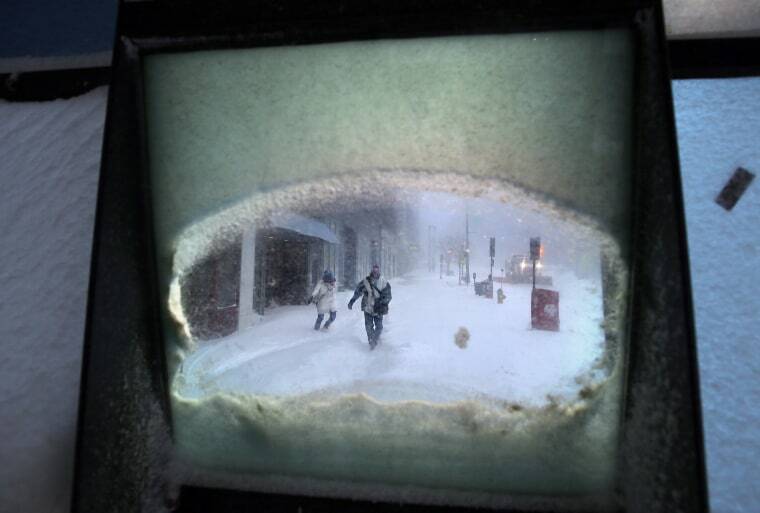 Jennifer Rice and Mike Femia battle wind-driven snow as they make their way to their jobs at a pharmaceutical lab, as seen through a window, on Jan. 27 in downtown Portland, Maine.